William Youngerman buys and sells Honduras gold coins and other forms of coins and currency from Honduras and countries around the world. The lempira is the official currency of Honduras and it is subdivided into 100 centavos. The first lempira was issued in 1931 as a replacement to the Spanish peso. The initial coins came in denominations of 5, 20 and 50 centavos as well as a 1 lempira coin. Shortly after the release of the first lempira coins, 1 centavo, 2 and 10 centavo coins were released. The only lempira coins still in circulation today are the 5, 10, 20 and 50 centavo coins. Prior to the lempira there was the Honduran real and the Honduran peso. The real was the official currency of Honduras, introduced in 1832 and used until 1862. 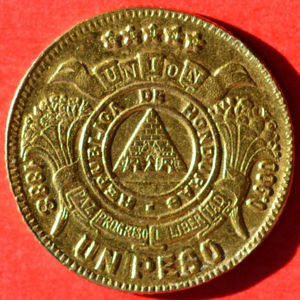 In 1862 the Honduran peso was introduced and the popular gold 1 peso coins were issued. Between 1883 and 1889 gold Honduran coins in the denominations of of 5, 10 and 20 pesos were released. If you would like to buy gold coins from Honduras, or have a collection that you would like to sell or have appraised, then William Youngerman Inc is the rare gold coin dealer for you. We have a consistently updated inventory of rare and valuable Honduran gold coins for you to choose from. We also offer on-site grading and appraisal services and will be prepared to give you an immediate offer for your gold Honduran coins on the spot. Call today at 1-800-327-5010!